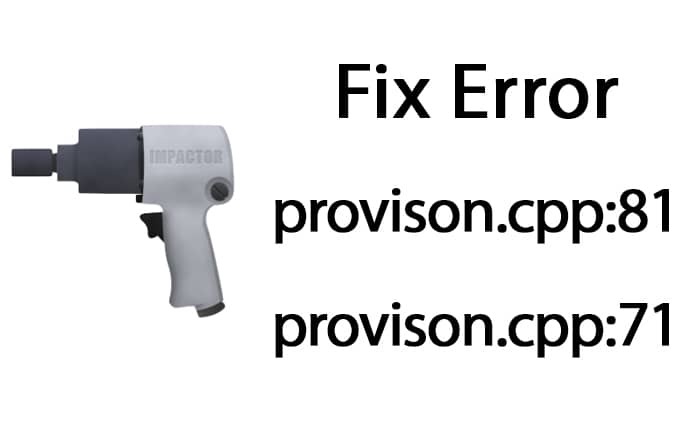 Here is how to fix Provision Cpp 81 error on Cydia Impactor while installing iPA file. Another day, another emerging issue for iOS users. So, we all know Cydia Impactor is one of the amazing tool by Saurik. We can easily install any iPA file on our iPhone, iPad or iPod Touch for free. However, sometime we may face any error. Here are some popular errors like Provision Cpp 81, Provision Cpp 71 and etc. In this tutorial, I will teach you how you can fix Provision Cpp 81 error and install your iPA file easily. There are couple of methods available for this. I am going to share them all with you in one topic. I hope you will find any of the given method helpful. What is Provision Cpp 81 Error? If you are not familiar with the error, then you need to know about it. Check what’s causing this error. There are couple of reasons which are causing this error. Here is a look at the error. There are quick ways to fix this error in few minutes. Follow the methods and fix for you easily. As i said, there are different methods available to fix this error. So let’s start. I don’t know what you have tried and what not. Still here is a chance for you. At ther very first, I suggest you to check the Cydia Impactor Update. You can fix this issue without any headache so please download the Cydia Impactor latest version for Windows, Mac or Linux. Usually I have founded this method working for members in my Facebook iOS Environment Group. So, why not you try this method. At first, Open Cydia Impactor. Go to XCode > Revoke Certificates. Input your Apple ID and Password. Try installing the IPA File again. If you can’t find this method working for you, please consider the other methods given below. You can also fix this issue by using the install package option in Cydia Impactor. Go to Device > Install Package. Let Cydia Impactor process the file. To be honest, I have never tried this method in my life. But, you should try this method if you are facing Provision Cpp 71 or Cpp 81 error on your device. I have seen this method working. Usually Apple can’t verify your account for installing an app. So you may have to create a new Apple ID for free. You can use AppStore on your device to search a free and then easily create a new Apple ID for free without credit card. You may have enabled the Two Factor Verification on your Apple ID. So please disable this verification because it is causing the network error. However, if you don’t wanna turn off this step verification on your Apple ID, you can create a new one for free as I have mentioned above. I hope you will find this tutorial useful. If you have found this article helpful, and have question please comment below. Do you find this helpful? Share it with your friends and let them know about this too. For more tutorials and updates keep visiting us. Also, like our Facebook Page for right NewsFeed.